16" x 8.5" x 8.75"
The mask shown here is the only one in the collection worn exclusively by women. 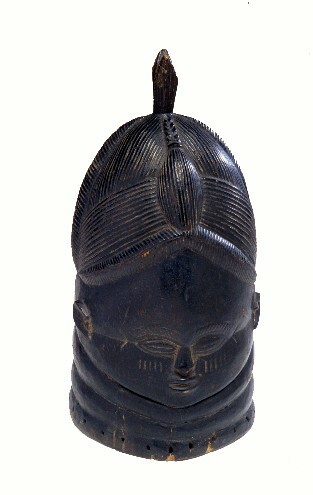 Women of the Sande society, an association to support women's role in government, wore this type of mask (called Sowei) during a ceremony celebrating both female water spirits and the founder of the Sande society. Women were chiefs until the 1970s when the growing prominence of Islam reduced the role of women in the Mende culture. The Sowei mask (carved secretly by men) emphasizes the ideals of feminine beauty. The depiction of a full forehead, smooth skin and diminutive features was achieved by carefully carving, smoothing the light-weight wood with ficus leaves, dying the wood black, and polishing the surface with palm oil. Bibliography: Fagg, 1980, p.52; Phillips, 1999, fig.5.136.